QXT– Best Image Quality - SOS Safety International Inc. The image clarity you have come to expect from the X Factor Family is further refined in the QXT. 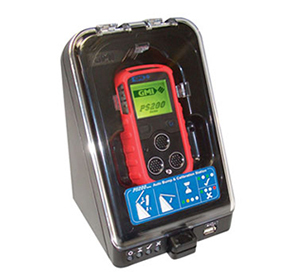 Equipped with an ultra-high performance LCD display that greatly increases brightness and contrast, the QXT lets firefighters see more clearly in smoke and direct sunlight. 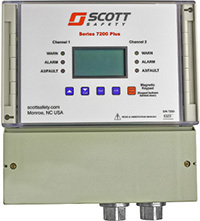 Bullard’s QXT can exceed eight hours of continuous run time for the ultimate performance in fire conditions. The QXT comes equipped with the industry’s first wireless desktop charger that allows for easy continuous use of your thermal imager. A wireless truck mount charger is also available as an optional accessory. 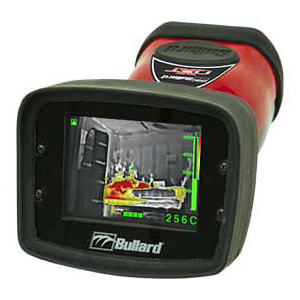 The Bullard QXT is loaded with advanced features including Super Red Hot colorization, intuitively highlighting high-heat scenes in brilliant shades of yellow, orange, and red, and temperature measurement in numeric and relative heat indicator formats. 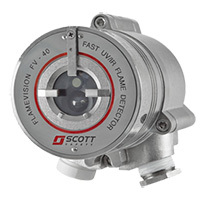 Optional features include Bullard’s exclusive Electronic Thermal Throttle®, which enables firefighters to optimize scenes with the touch of a button, 2X/4X Digital Zoom that allows firefighters to get closer to the action, and Bullard’s SceneCatcher Digital Video Recorder that allows firefighters to capture five hours of video and store hundreds of still images. off with a gloved hand. The QXT is built Bullard Tough for the way firefighters work. 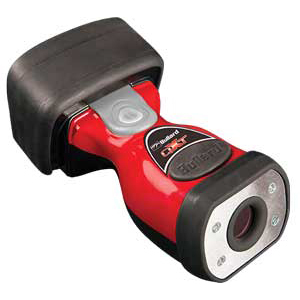 The imager comes standard with a five-year, industry-leading warranty on the QXT camera and on the battery, and a ten-year warranty on the detector.